The London Marathon is truly an achievement of a lifetime. One of the world’s most famous marathons, it is also the largest annual fundraising event on the planet – runners have raised over £750 million for good causes since the race began in 1981. The course follows an iconic route taking in many of London’s landmarks, from the Cutty Sark and the City to St James’ Park and The Mall. Unfortunately all of our places for 2019 have already been allocated, but please do register your interest for our 2020 team. There will be a post drinks reception for all our participants to celebrate this amazing achievement. If you managed to secure your own place through the public ballot and would like to run for Back Up, then do let us know as we’d love to have you on our team! 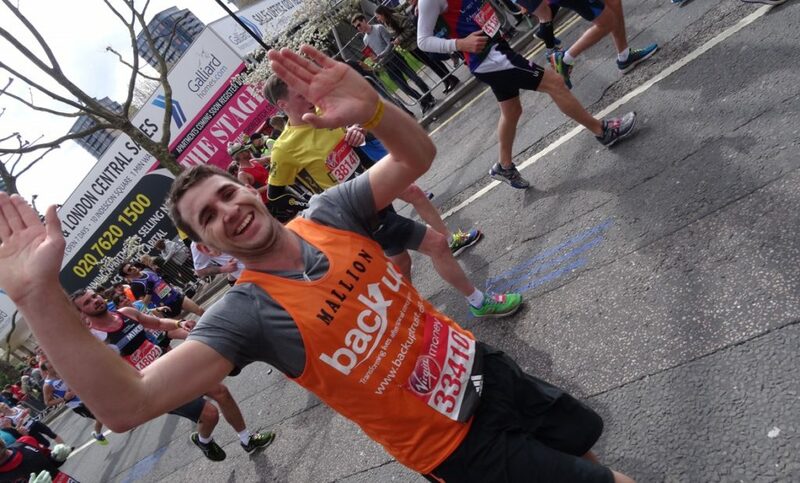 We will be taking photos and videos at the London Marathon for use in Back Up’s fundraising and marketing materials. If you want to find out more about how photos and videos will be used, or if you’re attending this challenge and do not wish to be featured, please contact our fundraising team using the details at the bottom of this page. If you would like to take part in this amazing challenge or would like more information then please give Alex a call on 0208 8875 1805 or send her an email. We have now selected our team for this year, but you can register your interest for our 2020 team.